The issue of politician polish is real – not all voters may be aware that the sheriff is an elected official, and because the county races are technically non-partisan, voters may not be as aware of the candidates’ platforms and records. While the sheriff’s office is officially nonpartisan, it’s no secret that current Hennepin County Sheriff Rich Stanek is a former Republican legislator – and one with decisive campaign wins under his belt. He was a Republican member of the Minnesota House of Representatives from 1995 to 2003, representing 33b, a district comprised of residents of Maple Grove. When he first ran for sheriff in 2006, he won 65 percent of the vote. He was re-elected in 2010 in an unopposed race, and when he ran in 2014 he beat challenger Eddie Frizell by more than a two-to-one margin. In 2014, Stanek was re-elected with 234,840 votes. The population of Hennepin County is 1.22 million people and has 744,857 registered voters. This means that a mere 19 percent of the residents of the county voted Rich Stanek into power, again. A handful of municipalities consistently lead in terms of showing up to the polls to vote in the sheriff contests. 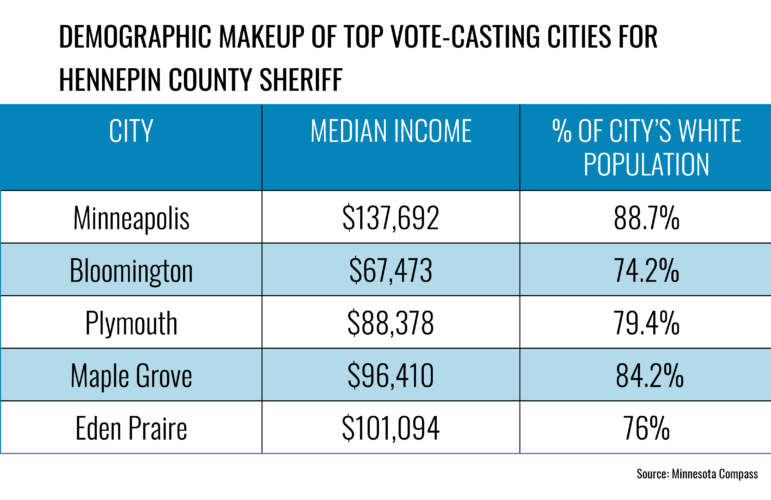 In 2014 and 2010, the top 5 voting municipalities in the sheriff’s race were Minneapolis, Bloomington, Plymouth, Maple Grove and Eden Prairie. In 2006 it was Minneapolis, Bloomington, Plymouth, Maple Grove and Minnetonka. Edina and Minnetonka followed Eden Prairie closely in all three years. Immigrants and their families are feeling the divide between the county sheriff and Minneapolis city police. Stanek has been public about his directive to his office to cooperate with U.S. Immigration and Customs Enforcement, better known as ICE, a federal agency under the jurisdiction of the Department of Homeland Security, a cabinet-level office founded by George W. Bush in 2002. In a September 2017 statement, Stanek announced that once county officers arrest someone, the officers will ask the person their place of birth, and if that person is foreign-born, the office will share that information with ICE. “Where his true philosophy lies has come out more since the Trump administration came over and those policies changed, and he has been cooperative. It’s clear now he’s on board with the Trump immigration policies and doing what he can do here to advance that,” said Moriarty. Nekessa Julia Opoti, writer, co-founder of the Black Immigrant Collective and communications strategist of the UndocuBlack Network, condemns the cooperation between the county and the federal organization. “Despite having separation ordinances, cities like Brooklyn Park, Brooklyn Center, St. Paul and Minneapolis do not have city jails. Folks who are arrested are held in county jails, and their information is then shared with ICE,” said Opoti. Because jails in Minneapolis are managed by the county and not the city, Minneapolis residents are especially vulnerable to Stanek’s cooperation with ICE. The immigrant community in Hennepin County must also contend with the destructive presence of the Countering Violent Extremism (CVE) program, run by the sheriff’s office and funded by a $347,600 grant Stanek received from the Department of Homeland Security. Opoti has seen firsthand the dangers the program has created for families already struggling with immigration-related issues, language and economic barriers, Islamophobia, xenophobia and racism. “What the program continues to do is criminalize Muslims, particularly Somalis and Oromos. The program, which has allowed for an increased FBI presence in Minnesota, has individuals spy on each other, and includes surveillance and profiling by youth workers including those working in school districts, local enforcement and nonprofits. His CVE surveillance does not just include Somalis but Liberians and Latinos as well,” said Opoti. According to the Brennan Center for Justice, CVE programs “unfairly target Muslim and minority communities as inherently susceptible to terrorism.” Stanek’s Homeland Security grant also paid for the county’s adoption of the City of London’s Red STOP program, which allows community members to anonymously report any internet content that they believe promotes terrorism or encourages people to commit terrorist acts, as well as specific websites or videos posted by terrorist groups. In 2016, Hennepin County was one of three Minnesota counties to send officers to Standing Rock, North Dakota to apply policing control against the growing number of Dakota Access Pipeline water protectors. Stanek stated he was just acting upon the state of emergency declared by the state. 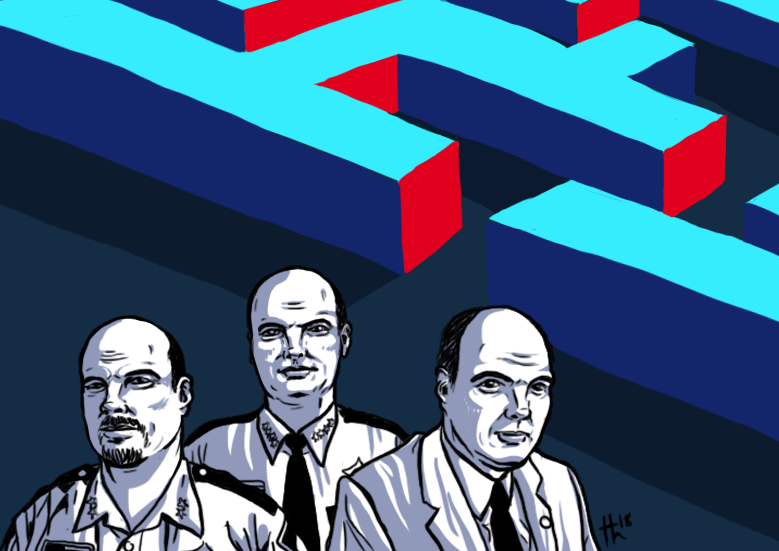 The sheriff manages our urban spaces of punishment: the adult detention center in downtown Minneapolis, both the City Hall jail, which holds 509 beds, and the Public Safety Facility, which holds 330 beds. Stanek recently asked the governor for funds to provide more bedding to convicted jail residents who suffer from mental illness, as the jail is required to provide separate quarters for these individuals. Overcrowding and understaffing have been major issues of the county jails, with major felony crimes seeing an increase as well as the caseloads of the public defenders serving the county. The office also controls the crime-related forensic analysis in our county, operating one of six crime labs in Minnesota, processing evidence related to property crimes such as theft, shoplifting and stolen vehicles, together which make up 50 percent of the lab’s use. In 2017, County Commissioner Marion Greene proposed an amendment to create a regional crime lab, replacing the Hennepin County crime lab and possibly merging it with the city of Minneapolis’ crime lab, citing the recommendation for independent oversight of crime labs from the National Academy of Sciences. Stanek opposed it saying that a merger would add to wait times for forensic analysis. Local public defenders such as Moriarty were in favor of the amendment, stating that the lab being under private management would allow for more transparency when it came to lawyers seeking evidence from the labs. The office also carries out different types of civil processes, such as subpoenas and domestic abuse orders for protection. Upholding arrest warrants and other commitments from local courts, and bringing in wanted persons back to Hennepin County for holding is also part of the sheriff’s work. Hennepin County has more than 270 sworn deputy sheriffs. One of their duties is to perform “warrant sweeps” in conjunction with local police forces to search for multiple suspects. Most notably, the sheriff’s department was accused of conducting one of these sweeps on the day of the primaries in August at the Little Earth housing complex in south Minneapolis. A large number of sheriff vehicles were seen near the Ojibwe housing complex, with some accusing the department of voter intimidation with the sweep. Additionally, directed patrols are conducted in areas of higher crime activity, and the Deputies are the primary law enforcement provider in smaller Hennepin County communities such as Greenfield and Medicine Lake. The loss of life from opioid addiction is also part of the sheriff’s domain. According to the Hennepin County website, there were 153 deaths by opioids in 2016, a 39 percent increase from 2015. In 2017, there was a smaller increase with 162 Hennepin County opioid overdose deaths, nine more than the previous year. As a result of the rise in deaths, the sheriff’s office started the #NOverdose campaign to educate parents and youth about the dangers of opioids and has partnered with schools and county officials in the name of effective prevention and treatment resources. The office has a number of safe medicine disposal sites in the county for residents. According to a study conducted by the Department of Health, Minnesota had the highest disparity ratio of opioid-related deaths between Native American and whites. In 2015, Native American Minnesotans were five times more likely to die from an opioid overdose than white Minnesotans. It is also important to note that Hennepin County had by far the highest number of overdose deaths among Minnesota counties between 2000 and 2016 with 1,185; the next closest county had 371 deaths. The sheriff equips the officers with naloxone, a fast-acting drug that can reverse opioid overdoses in an emergency situation and provides drug counseling, as well as two doses of naloxone and a lesson on how to administer the medication to inmates leaving the jail. On November 6, voters in every precinct in every city in Hennepin County have the opportunity to decide who will lead this office. 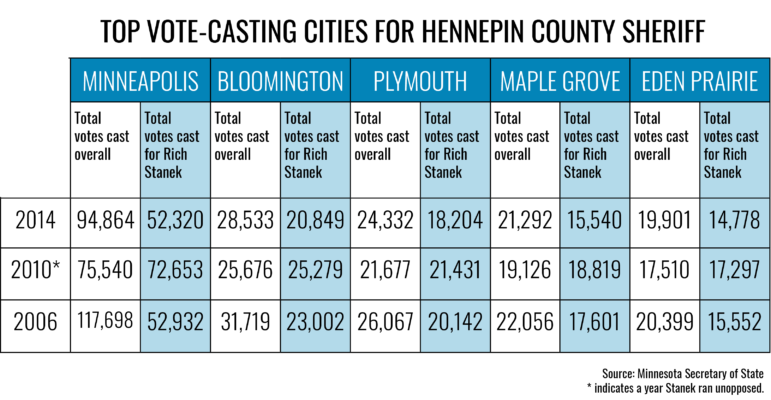 The outcome, whether it gives Rich Stanek a fourth term or brings in his challenger, Dave “Hutch” Hutchinson, will have far-reaching consequences for criminal justice for all 1.2 million Hennepin county residents. the time has come for change in the sheriff’s office. I don’t know either candidate, but the record of the incumbent is troubling. I’m going to vote for his challenger because I like his vision for the office. Very interesting. I’ve never voted for Sheriff but I will this time-I won’t vote for Stanek.